My entry ‘Constructing a Cone’ was much to wordy ;-), therefore I wrote an online cone calculator. Note: Unfortunately the online cone calculator seemingly doesn’t work under all circumstances and I don’t have the time to struggle through. That’s why I write the formula by all means behind. calculate the cone data yourself using the following formula. The black cone is what we want to get. Draw two centered circles with the inner and outer diameter, draw the calculated angle and cut it away. If you don’t have a protractor you can print and cut the degrees disk from the entry ‘Constructing a Cone’. Thank you for this calculator, and for the other article where you explain the geometry behind it! Appreciate your effort. I’m always looking for examples to show my children why the should study maths. But you’re right of course: math can be sooo helpful at times! I’d never thought that you’d need a cone to make a combustion chamber for a pulse jet engine! Worked it through three times, three different results none of which looked convincing. Used your machine and at last a decent result, and I thought I was good at maths! Thanks. Does this factor in any overlap? You’ll have to make an overlap on your own. Thank you for putting all of this information in one place and writing it in a way that is easy to grasp. Much appreciated! Is there a way to make a digital template of the cone for making lampshades? I would like an exact size Jpeg image so that I can paste graphics and images onto the template and then print out . I can easily add an overlap when cutting out the final printed cone. SN, thank you for your interest. 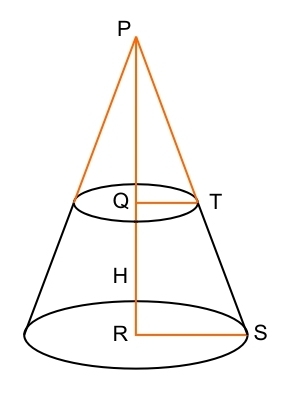 Sorry, I cannot provide such a picture, but have you checked my entry Constructing a Cone? I describe there how to use the information you get with this cone calculator to immediately make a template without the use of a printed picture. I hope that this helps you making your lampshades. Good success with the reducer!